Godwin, the 2017 North Carolina Teacher of the Year, was listed as a press conference participant but decided not to attend because of concern about how the program would be funded. “I was under the impression it was $400 in new money on top of what districts already receive,” Godwin said in an interview shortly before the State Board of Education began its monthly business meeting. Godwin, an elementary school teacher in Onslow County, was referring to the nearly $50 million in state dollars school districts in North Carolina are allocated each year to purchase school supplies. Under Senate Bill 580, announced by Johnson and Wells, about $40 million would be stripped from local school districts and given to teacher who would use the ClassWallet app to spend the money or to claim reimbursements for money they spend out-of-pocket. 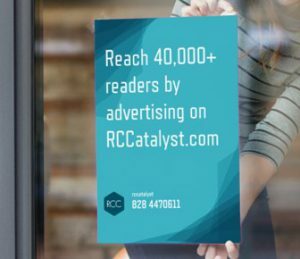 Similar programs operate in Florida and New Mexico, officials said. Johnson struggled to answer when asked by a reporter why Godwin did not attend the press conference. State Superintendent Mark Johnson talks about a new program to pay teachers $400 a year to buy classroom supplies during a press conference Wednesday. He said there was “a conversation yesterday” and Godwin was excited about the program. When she agreed to attend the press conference, Godwin said she believed the program would be funded with money on top of the annual state allocation for school supplies. 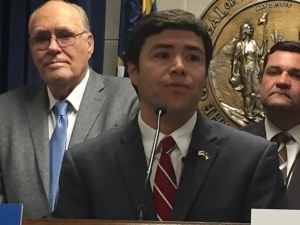 Godwin said there could also be repercussions for teachers if the bill is approved by the General Assembly. Teachers spend nearly $480 a year of their own money on classroom supplies, according to a study by the National Center of Education Statistics. So instead of reallocating supply funds, Godwin said she will encourage lawmakers to increase funding. “We’re already underfunded, period,” Godwin said. But Godwin’s call for increased funding, runs counter to the reason Wells contends SB 580 was filed. Wells said school districts across North Carolina have misspent money intended for teacher supplies. 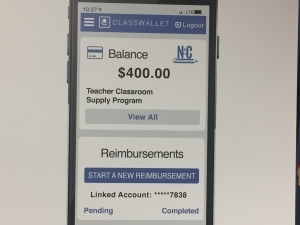 The ClassWallet app teachers would use to pay for classroom supplies or to claim reimbursement for money spent out-of-pocket. Figuring out what local school boards spent the money on is difficult, and varies from district-to-district, Wells said. “The short answer is the bureaucrats used the money to pay for other things on their to-do list and left teachers paying for their own classroom supplies,” he said. Johnson, who taught high school in Charlotte for two years as part of the Teach for America program before attending law school, said he remembers seldom having enough copy paper. He said he often dug into his own pockets to buy supplies or relied on donations from organizations such as Classroom Central or Educator Warehouse. Johnson said teachers know best the needs of their students. “If we truly want to treat teachers as professional, if we truly want to put our money where our trust is, let’s show teachers we trust them to make the right decisions for their classrooms,” Johnson said. The N.C. School Supplies Program would began next school year if approved by the General Assembly. It would be mandatory for traditional public schools, but charter schools could opt into the program. 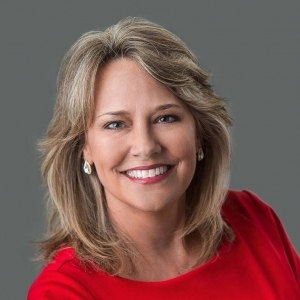 The bill’s primary sponsors are Wells, Sen. Deanna Ballard, (R-Surry) and Sen. Jerry Tillman (R-Guilford). A companion bill is expected be filed in the House. Rep. Jeffrey Elmore, (R-Wilkes), said the program would give teachers flexibility and increase transparency around how school supply dollars are spent. Meanwhile, Godwin cautioned teachers, who she said will understandably be excited about receiving $400 for classroom supplies.